After far too long a wait (14 years! Hollywood sequels never take that long these days!) The Incredibles 2 is out in the world and a pretty obvious candidate for the LEGO treatment. True to form, the action takes the form of a spot of platforming, a dash of puzzle-solving and a big old dollop of action, all delivered in the LEGO series' irreverent blocky style. As ever, a lot of the best moments come from teaming up with a pal for offline co-op, and developer Traveller's Tales has leaned into it a little more heavily than usual. The Incredibles' powers combine to create cool new abilities, such as Elastigirl turning herself into a human trampoline for someone else to use or Violet throwing a force field around Dash to protect him. Part of what has made recent LEGO games such as the Marvel and DC Comics titles a success has been the deep bench of characters that pop up. The Incredibles doesn't have the same roster as either of those universes, but that's good news for Pixar fans - it means that other favourite Pixar characters show up instead! 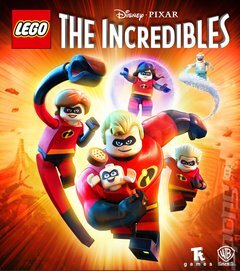 LEGO The Incredibles has been a long time coming, but it's the celebration of Pixar that fans have been waiting for.